My rating: 9/10. Very good watch. Impressive luminous features. Today I’m doing a Luminox 3015 blackout review. Luminox are a pretty serious brand. 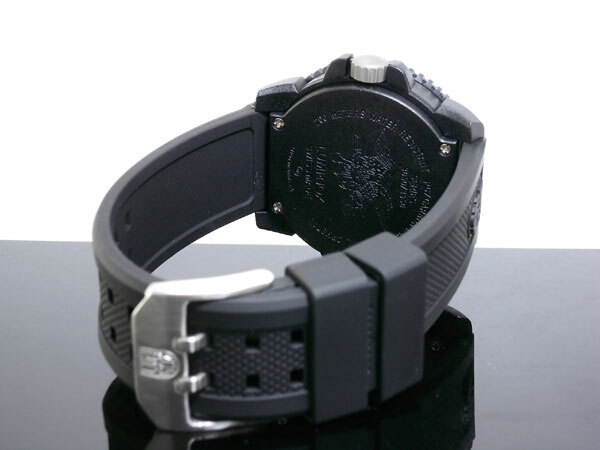 They create branded watches for a variety of military groups and include custom insignias and designs. In the past ,they’ve made watches for the US Coast Guard, US Navy SEALS, US Air Force, and plenty of other special forces and EMS teams worldwide. 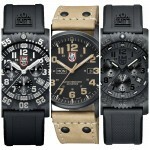 At present Luminox offers three lines of water resistant watches “Sea”, “Air”,and “Land”. This Luminox Evo Navy Seal Blackout is part of their Sea collection. The Luminox 3015 blackout is a very impressive watch. 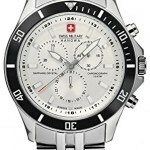 At its core, it features a Swiss Quartz movement that gives you brilliant accuracy. There is a simple date display at the 3 o’clock position. It’s a very hard wearing watch, the dial is protected by a tempered mineral glass and the case is made of polycarbonate that’s carbon reinforced to give it extra strength. This case design mixed with the carbon makes the watch very lightweight which is definitely a bonus. 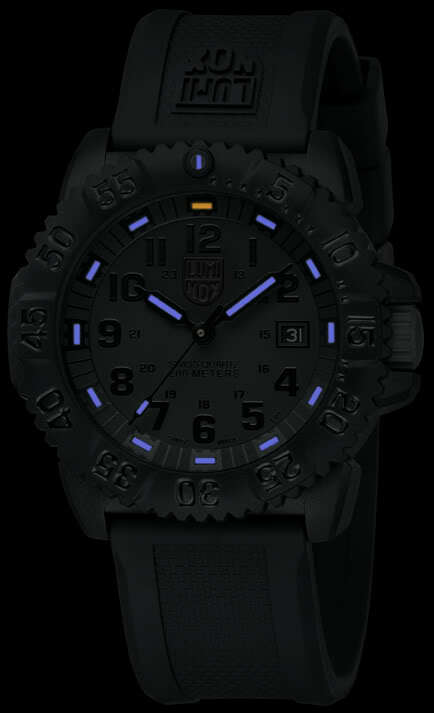 The Luminox 3015 blackout also features some brilliant low light features. The watch hands and markers contain tritium inserts. These provide long-term luminescence and are much higher quality than traditional lume features on a watch. I’ll explain it in a bit more detail below. I hope you enjoy having a read through my detailed Luminox 3051.BO review. I figured I’d show you a quick glimpse of the Luminox 3015 technical specifications. We will take a look at some of these in more detail later, but for those who like to skim read, here you go. Extra Features: Date display / Tritium luminescent. The Luminox 3051.BO is built to a very high standard and being Swiss made delivers on what you would expect. Instead of using basic materials this watch has gone all out. Luminox are known for making very high-quality durable timepieces. The Luminox 3051 features a very durable case design that’s made of a carbon injected reinforced polymer. If you want something lightweight, comfortable and very accurate then this timepiece is well worth a look. The dial blends in with Luminox’s all black design for this watch. Whilst you may think that would make it very hard to read when it’s dark this watch is actually specifically designed to make reading in darkness very easy. To do this the watch features tritium gas tubes. Tritium is a gaseous light source that undergoes beta decay, when it releases electrons this causes the phosphor within the gas tubes to fluoresce. This gives you an incredibly reliable long-lasting source of light. As you can see from the image above, it makes it very visible. During the day the watch is also quite easy to read due to its raised embossed numerals and its white date display. 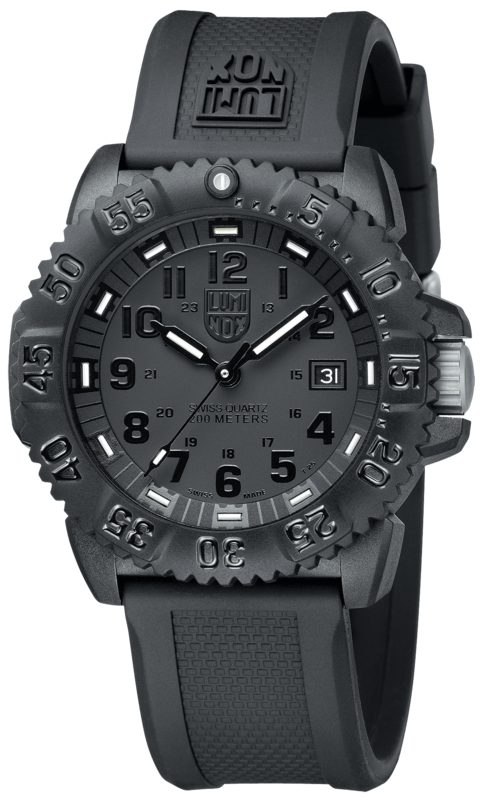 The Luminox 3051 features an oversized design to it. With a casing diameter of 45mm, it’s sure to stand out on your wrist. As far as thickness goes the case stands at 12mm so it avoids being overly chunky. So whereas it’s ideal for those who love larger watches it may not be suitable for people with smaller wrists. This watch features mineral glass. Mineral glass is specially hardened to be more resistant to scratches. While I would say I would have hoped for a sapphire glass at this price, I can understand why they would go for mineral instead. While sapphire glass is scratch proof and much better than mineral glass for that purpose, it isn’t as shatter resistant. When you consider that they wanted to make this watch harder wearing and more drop resistant, then mineral glass is the way to go. 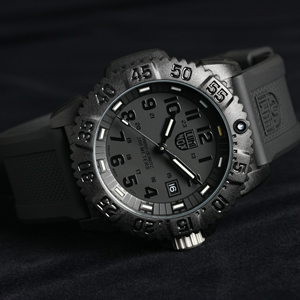 The Luminox Evo Navy Seal 3051 blackout features a 23mm wide band made of rubber. This band is very durable and a great match up for the casing design. The double locking buckle also offers extra sturdiness and you can see it in the picture featured further down in this Luminox review. The Luminox 3051 has quite a good level of water resistance at 200m also known as 20 bar. 200m water resistance is classed as suitable for professional marine activity, serious surface water sports, and skin diving on Wikipedia. It’s worth knowing that water resistance is measured in a still testing environment and focuses on water pressure, so 200m water resistance doesn’t mean you can take it 200m deep. What this watch does lack in this department is a screw down crown that you would often find in higher rated water resistant watches. If this is a feature you require then I’m sorry to say but this watch won’t be suitable for you. Instead, they have opted for a double-security gasket, which is interesting and you can find some information about it here. The Luminox features a Swiss Quartz movement at its heart. When you buy a Swiss made watch you expect to see a Swiss movement so this is as expected. The Swiss Quartz movement offers you brilliant accuracy at all times and has a long lasting battery life. Hello again to all the skim readers, another one of your favourite parts, the easily digestible pros & cons list. We understand not everyone has the time to fully read through a review of this size so we thought we’d help you out. 200m water resistance is suitable for professional marine activity, serious surface water sports and skin diving. Lacks a screw down crown which is something I would have liked to have seen in this price range. Due to its oversized design, this watch may not be so suitable for people with smaller wrists. There you have it, a pretty detailed look at the Luminox 3051. This Luminox is part of the 3050 series so you could consider this relevant as a Luminox 3050 review. 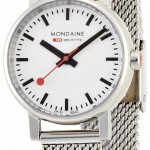 The have a selection of watches available in different colours but for the most part, the hardware is the same. It’s easy to see why the Luminox 3051 has been so popular, this black out models appeals to what people want at the moment, great looking high-quality timepieces for a fair price. Overall I’m a pretty big fan of this Luminox 3051.BO its well built and has some really nice features. Having taken quality, materials, features, and pricing into account this watch receives a very fair 9/10 from The Watch Blog. There are a few options for when it comes to buying the Luminox 3051 online. I always stick to recommending retailers that I’ve purchased from in the past so I’ll link to each of their sales pages below. I suggest taking a look at all 3 and comparing the prices for yourself. I hope you enjoyed having a read through of this extensive Luminox 3051.BO review. As always let us know in the comments what you thought.